The Year aims to heighten public awareness of the nutritional benefits of pulses as part of sustainable food production aimed towards food security and nutrition. It will create a unique opportunity to encourage connections throughout the food chain. For us, the International Year of Pulses 2016 thus offers an opportunity to celebrate the major impacts that our research has registered so far, and also to call on donors and partners for renewed support. Their commitment is critical for translating the remarkable achievements of recent years into new rounds of improvement in global pulse performance, and in the food and nutritional security of the approximately 300 million people who depend on these crops. Nutrition just got more affordable and accessible! on CGIAR Research Program on Grain Legumes’s website. More stories on bean-producing countries coming soon. Stay tuned! Burundi has a long history with the Pan-Africa Bean Research Alliance (PABRA). As one of its founding members, along with Rwanda and DR Congo, Burundi once had a strong bean research programme supporting improved food security and nutrition for its population of 10 million. Sadly, the programme suffered during 17 years of civil war. Since its end in 2005, the formidable Capitoline Ruraduma, Burundi’s bean research programme leader at the Institut des Sciences Agronomiques du Burundi (ISABU), has been working hard with her team and partners to restore it with the support of PABRA. They are determined that the current situation, which has left the international community fearing for the stability of this small landlocked country, will not halt progress. Her commitment and that of partners to ensuring the project meets its aims is palpable. It stems from a real need to intensify and improve agriculture for a growing population, most of whom live on less than $1.25 a day. Even before recent events led to food price hikes and falling incomes, less than one third of Burundians were food secure, and more than half were chronically malnourished. PABRA works with 30 countries across sub-Saharan Africa to tackle these issues. In Burundi, where bean consumption is among the highest in the world (around 50 kg per capita per year before the civil war) and more than 90% of farmers grow beans for food and income, they could prove an even more potent entry point. In Ethiopia, CIAT through Pan-Africa Bean Research Alliance (PABRA) works closely with partners including Ethiopian Institute of Agricultural Research (EIAR) and Agricultural Commodity Supplies (ACOS). The biggest impacts of climate change are expected to be reduced volume of beans on the market, together with increased incidence of pests and diseases. This is a risk for consumers and canning companies who depend on Ethiopia for their bean supply, and especially for farmers. 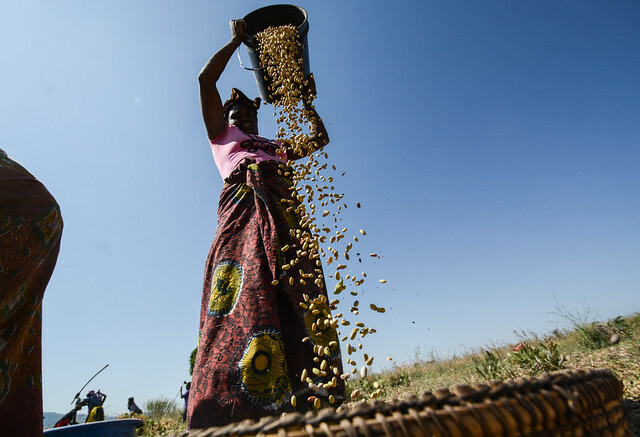 CIAT and PABRA are collaborating with scientists at the Ethiopian Institute of Agricultural Research (EIAR) to test and evaluate new drought-resilient bean varieties. Within two or three years, the best-performing varieties will have been whittled down to two or three top choices by researchers in Ethiopia. These will be evaluated by a release committee and officially approved before being made available for farmers to buy and grow. Beans are a staple food in Colombia and across the world: beans. Among a host of useful characteristics, some of the bean varietie s bred by CIAT and partners contain higher levels of iron. Many of these have already been adapted to conditions in different parts of Africa and released widely as part of an effort to tackle iron deficiency, particularly in woman and girls. The irony is that iron deficiency still exists in parts of Colombia – particularly in rural areas affected by the civil war. The prospect of peace in Colombia means more of these “biofortified” beans can reach those who need them. As change comes to Cuba, the International Center for Tropical Agriculture (CIAT) – a member of the CGIAR Consortium – is committed to playing a key role in supporting the modernization of agriculture. Vital to this process is improved technology, methods, and knowledge that better enable farmers to enhance eco-efficiency in agriculture. Beans are part of nearly every meal in Cuba. But local bean farmers face less reliable growing conditions due to increased drought, heat, and other effects of climate change. Through the CGIAR HarvestPlus program (formerly AgroSalud), which is jointly led by CIAT and the International Food Policy Research Institute (IFPRI), national researchers developed and released various improved bean varieties from 2010 to 2012. The improved varieties show drought tolerance as well as increased micronutrient content. CIAT proposes to help raise the productivity of beans in drought-prone areas of Cuba through further development of improved bean varieties and associated crop management practices. Working through HarvestPlus and other global networks, CIAT can also support work on other important crops in Cuba, such as cassava and rice. 25% of crop land use. Beans are also among Rwanda’s top commercial crops, constituting 78% of total pulse production and contributing importantly to diets, nutrition, and income security. High-yield climbing bean varieties are two to three times more productive than other varieties. Today, improved climbing beans are planted on more than half of the country’s bean production area, representing a 45% increase since 1985. In the last decade, the country has been transformed from a net importer to an exporter (with exports valued at US$12-20 million), as yields have increased from 0.7 to 1.1 tons per hectare. Dry beans are Myanmar’s largest agricultural export accounting for more than half of total exports, making the county only second to China in exporting beans. With a genebank containing nearly 36,000 samples of beans – the world’s largest collection of Phaseolus beans – CIAT can provide significant research capacity support in Myanmar to improve the production of important bean species. Our goal is to make bean production more profitable for smallholder farmers and to boost the nutritional value and supply of beans, through large-scale introduction, evaluation, and dissemination of improved beans. New “biofortified” beans have been bred by researchers in DRC, neighbouring Rwanda, and CIAT in Colombia to contain up to double the iron and 70% more zinc than regular beans, using the same methods of crop selection that farmers have been using for thousands of years. HarvestPlus and its partners test and evaluate the beans before they are released. The beans are then grown in sufficient quantities to supply to farmers – a process known as seed multiplication. In a country where around a third of the population is anaemic, with low iron intake linked to high rates of maternal mortality, and low zinc associated with stunting in children, producing beans with higher levels of these nutrients is a novel way to address the problem. The magic beans’ ancestral home is Mesoamerica – the area from Central Mexico down to northern Central America. Their ancestors were collected and conserved in the CIAT gene bank in Colombia, and screened for interesting traits. That’s where they were found to have the potential to withstand drought. They were crossed and selected for drought tolerance by bean scientists at CIAT headquarters and then sent to Malawi. Next followed field tests with farmers in Malawi, via the CIAT-led Pan-Africa Bean Research Alliance, together with the country’s Department of Agricultural Research Services. These helped researchers pinpoint the two most promising varieties. The farmers were stunned when they saw how well these beans performed. More profiles coming during 2016. Stay tuned! More profiles coming throughout the year!